Preschoolers are naturally curious. They want to know how things work and why things happen. Science activities allow opportunities for preschoolers to explore, discover how things work and ask questions! Our 5 step system will show you how to take your student’s questions and create a meaningful science experience that connects with your students. On average, preschool children ask about 100 questions a day (or more if you are like my four-year-old) but by middle school children have stopped asking questions. Why do middle school age kids lose interest and become less engage? How can we encourage young children to ask good questions and be curious? This answer has always stuck with me. The goal of science activities at the preschool age is not to memorize facts but rather how to gain knowledge through observations, experimentation, and play! Science is about connecting children’s senses to the world around them. As educators, we must spark this curiosity and sense of wonder especially when they are young so they continue to ask questions as they grow older. One easy way to foster a sense of wonder and incorporate the five senses is through open sensory play. Sensory activities for preschoolers is essential to child development. Sensory play stimulates the senses allowing the brain to learn through play. Sensory activities have been described as “food for the brain”. You can read more about the importance of sensory play here. An easy way to integrate sensory play into your classroom is with discovery tubs or sensory bins/tables. They are easy to set up and encourage hands-on play. As your children are exploring the sensory table or discovery tub observe their questions and play and use that to connect their interests to additional science activities and experiments. Take your preschool learning theme and brainstorm ways you can create a sensory experience that relates to your theme. Check out the links below to help get started. A sensory bottle is another easy way to integrate sensory activities into the curriculum. A sensory bottle is a clear sealed container that is filled with a variety of liquids or objects to encourage observation and inquiry. While the children are exploring the sensory activities you have set up, observe and listen to the children. What questions are they asking? What are they interested in learning more about? Make a note of the questions they ask. 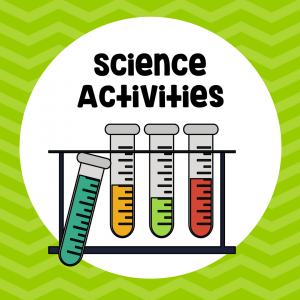 Use these observations to plan a related science activity to stretch and grow their learning while connecting to their interests. How do you choose the perfect science activity? Consider what your students’ interests are and plan to extend their learning with a balance of activities from the different sciences such as physical science, earth science, and life science. Provide a range of activities related to matter and energy, earth and the universe along with the study of living things. To help get you started click on the links below to see full step by step tutorials on a variety of science activities. Physical Science is exploring natural forces and the basic elements. Try pendulum painting to visibly show the forces of motion or play with the force of magnets with a Superhero challenge. Explore sound by creating your own DIY instruments. Click the links below for more physical science activities. Earth Science includes the properties of the earth, ocean, and universe. Observe the environment around you by collecting and studying rocks. Observe weather patterns and changes of the seasons. Learn about space and our solar system through hands-on play and exploration! Life Science is the study of living things. Observe insects and other animals in the environment around you. Study the life cycle of plants and learn about your own body! Science activities for preschoolers should connect to their prior knowledge. Integrating between subjects is a great (and easy) way to connect your student’s learning. STEM or STEAM activities make it easy to integrate science into other disciplines. Allow time for your children to share their findings and results. Draw pictures or create classroom collaborative display to show other students, teachers and parents. Also, allow time for student reflection. This can be done in a whole group setting. Make sure to allow time for your reflection too. 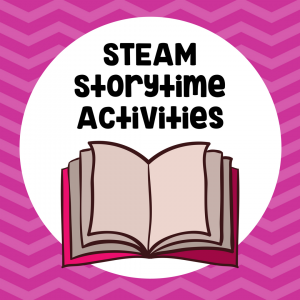 What other activities connect their interest and will help stretch their thinking? Taking the time to reflect after the science activity will help make it go smoother the next time. So, how can we encourage young children to ask good questions and be curious? In your curriculum include a variety of science activities that encourage children to wonder, to be curious, to ask questions and learn through play!